Long before we left on our trip, I reread Live Your Road Trip Dream, by Carol and Phil White, a book that had inspired me to take a seven-week road trip after I retired from the City of Miami. This book demonstrated how one could travel for a year for the cost of staying at home. When we were developing a budget for our road trip, we looked to the book for advice and discovered that, indeed, we could take our trip for not much more than staying at home. The trip seemed to be something we could afford. Unlike the Whites, however, we had hoped not to have to rent our home while we were away. Although the income would have been nice and would have covered our expenses for the mortgage, utilities and other home-related expenses, we preferred not to have to pack up our personal items to make room for a renter if at all possible. Our solution to this came in the form of a nine-month job that I happened to get at the Estes Park Museum, just one year prior to leaving on the trip. Not only did I love the job, but I was also able to save what I earned and use that to cover our home expenses. There was even quite a bit left over to cover some of our other trip-related expenses. Live Your Road Trip Dream offered great ideas on how to develop a budget, and we used many of these ideas in creating our own budget. We erred on the high side in almost every category as we didn’t want to come up short part way through the trip. It’s been interesting comparing our budget with our actual expenses. Although we certainly did not scrimp on spending, we were pleased with the final figures. So, we are sharing these numbers in case anyone else might want to think about doing a similar trip. How Did We Spend the Rest of the Money? Last week I reported about our biggest expenses for the trip – diesel fuel, lodging and food. Those were big categories and accounted for approximately sixty percent of our total expenditures. But what about the other forty percent? Our next largest expense was RV service, maintenance and repairs at $4,736. We knew the RV would require two routine services while we were on the road and budgeted $2,610 for this category. Although it seems that we grossly underestimated this figure, we decided near the end of the trip to bite the bullet and upgrade the RV with an anti-sway bar and new shocks. That alone cost us approximately $1,715. Although the work was not required, we felt it would be a worthwhile expenditure and knew we had been coming in under budget in other categories. What we hadn’t counted on, however, was having to replace the tires. That was a painful, but essential, $1,167. Another big expense was entertainment at $3,924. This category included everything from admission fees, tickets and tours to boat and seaplane rides. We had decided even before the trip began that we preferred to spend our money on experiences, not things. Even though we did not scrimp in this category, we still came in under budget by $1,871. You see, that difference paid for the upgrade to the RV. OK, that brings our percentage of total expenditures up to seventy-seven percent. What else did we purchase? We did shop a little bit and spent a total of $3,283 for gifts, a few new clothes, a new camera and assorted books, souvenirs and other things. It’s a good thing we had decided to mostly forego shopping, since we did have a tendency to buy stuff once we walked into a store. Other “shopping” items included supplies for the RV, household supplies and a few office supplies. We did exceed our budget by about $400. Kitty, however, did a much better job and only exceeded her $475 budget by $2. Good Kitty. We only had a few additional categories that exceeded a total of $1,000. These included personal care expenses, such as haircuts, laundry and toiletries, at $1,396. We paid $1,395 for cell phone and internet access through our MiFi, as well as $1,294 for last-minute airline tickets to Colorado for both of us. We were under budget for the first two. Airline tickets, however, were not in the budget. Expenses relating to winterizing our house and having someone take care of the house and mail came to $1,372. We still had to pay the mortgage, condo association fees and minimal utilities, but we did not include those expenses in our trip expenditures. Other assorted expenses amounted to almost $4,000. By the end of this week I plan to post a chart comparing our original budget with our actual expenses. These numbers may change slightly, but they’re pretty accurate. After I finish with the chart, I don’t want to think about these numbers anymore! One of the things that Tim and I looked forward to every morning was looking to see if we had received any comments on our blog posts. This was one way we stayed connected with our family and friends, and we really appreciated the time that people took to check in with us. Near the end of the trip, we decided that we should acknowledge the person who had posted the most comments over the course of the nine months. We never announced a contest and didn’t tell anyone about our plan, so no one knew that a “prize” might be in the offing. We are pleased to announce that the person who posted more comments than anyone was. . .”LV”!!! Congratulations and thank you for entertaining us, commiserating with us and simply keeping us company. Close on the heels of LV was “A,” and we also loved reading your comments. While we were in Napa, LV posted a comment about one the photos we included. The photo featured a banner that read “Wine a Bit, You’ll Feel Better.” LV mentioned that she loved the banner and said that she had to have it. Well, we found a similar, although smaller, banner, and that is your prize. We hope that you will remember sharing our trip with us every time you look at it. The banner will be in the mail to you this week. Enjoy, and thank you. A small, but fast-burning fire began at noon today near the main entrance to Rocky Mountain National Park. Despite burning approximately sixteen structures on High Drive, as well as adjacent forest and grasslands, it seems that the fire has been mostly contained. hile we were at lunch we watched black smoke pour from the western part of town, although I didn’t have my camera with me to record it. Two helicopters from the High Park Fire, which has been burning near Fort Collins for two weeks, were quickly dispatched to Estes Park, and it was fascinating to watch them hover over Lake Estes and draw water into their tanks. I had never seen anything like that before. Our home is on the east side of town, and we were never in danger. Nevertheless, the fire was a little too close for comfort for me. It is scary to see how much of Colorado is burning, and it’s only June. Triple-digit temperatures, wind and low humidity are only adding to the danger. I’m afraid it’s going to be a long, hot summer. Where Did We Eat, What Did It Cost? Before we left on our trip, we had two ideas about food. We knew that we would eat out a lot, since experiencing local and regional foods was important to us, and we also thought we would cook many of our own meals. As things turned out, we did eat out a lot, but we almost never cooked meals from scratch. What happened? Even though our kitchen in the RV is tiny, we were fully equipped to cook almost any kind of meal imaginable. We had purchased a nesting set of cookware that took up very little room and had discovered ingenious silicone cookers that would enable us to cook an entire meal in our microwave/convection oven. We even had every utensil that we might need. We were definitely prepared. We just found that we lacked the motivation to cook. It all started in Maine when we couldn’t seem to get our fill of local seafood, especially lobster and crab. After living in landlocked Colorado, we were starved for fresh seafood, and we really looked forward to eating out. Lobster and crab were a little too messy to try and prepare in the RV, so we left the cooking to someone else. We decided early on that lunch would typically be our main meal of the day. First of all, lunch is usually less expensive than at dinner. Second, we looked forward to lunchtime as a nice break from driving or touring. However, our primary reason was the fact that it was just too inconvenient to go out for dinner. Once we arrived at a campground and got set up, we simply did not want to turn around and drive back out for dinner. It just wasn’t worth the hassle, especially once it started getting dark so early. Eating our biggest meal at lunch meant that we often had leftovers for dinner. We quickly got into the habit of not cooking, and when we didn’t have leftovers, we learned that we could purchase very good prepared foods at supermarkets or delis. We were often tired at the end of the day and did not want to add cooking to our list of other evening activities, which included writing blog posts and researching where we should go the next day. People often wonder if we got tired of eating out every day. I can honestly say that we did not. We almost never ate in chain or fast food restaurants and instead sought out local spots that featured “home cooking.” In nine months I can remember only a handful of restaurants where the food was pretty bad. Maybe I’m too easy to please. I will say, however, that while we did not miss our own “home cooking,” we absolutely loved it when friends and family prepared meals for us. That was a special treat. We loved sampling all sorts of regional foods, from local seafood along both coasts to down home Southern classics, and we were always on the lookout for barbeque. Then there was pie. We felt that it was our mission to discover the best pie in the country. Try as we might to come up with a winner, we just couldn’t choose. Almost every slice of pie we tried was wonderful. Although we often ate at places that would fit right in on “Diners, Drive-Ins and Dives,” we also treated ourselves to a really elegant dinner from time to time. We had some very memorable fine dining experiences, especially in Savannah and Yosemite National Park. So, I’m sure you’re wondering what all of this food cost. Our total budget for food was a generous $50 per day, or a total of $14,488 ($9,500 for dining out and $4,988 for groceries). We hoped that we wouldn’t spend that much, and we didn’t! Food ended up costing us approximately $13,155, or $45 per day, which also included treating friends and family to meals from time to time. The final breakdown was $9,200 for dining out and $3,955 for groceries. We came in under budget one more time! Could we have saved money on food? Without a doubt! However, we don’t regret our choices. We enjoyed eating out. Besides, by not cooking at night, we eliminated what could have become a stressful situation at the end of a long day. We did eat breakfast in the RV virtually every morning. We made coffee and had cereal with blueberries, a banana and orange juice, just like we always did at home. It was always a treat when we did go out for breakfast. We also rarely stopped for coffee and saved our latte money for a favorite dessert, which we always shared. When we were in an area where there were no restaurants to be found, we even fixed our own lunch. Picnics in beautiful surroundings were always nice. We did have to learn a new way of shopping. I had been accustomed to planning my grocery list around what was on sale, and I often used coupons. I also loved trips to Costco to stock up on “vats” of things we used in large quantities. All of that went out the window in shopping for the RV. First, we couldn’t wait for something to be on sale. Second, we simply didn’t have room for “vats” of anything. Instead, we had to buy the most expensive, small size package. Finding room for an extra box of cereal was a challenge. Given the small size of our refrigerator, we often had to shop twice or even three times a week. Murphy’s Law guaranteed that we never ran out of milk, orange juice and half-and-half on the same day, and since there was no room to store an extra container upright in the refrigerator, that meant another trip to the store. We ended up not minding our frequent stops for groceries, however. It was interesting to shop in new stores and discover how selections varied in different parts of the country. We always hoped to find tasty prepared foods that we would enjoy for dinner. The occasional trip to stores like Whole Foods, Trader Joe’s or local co-ops was always a special delight. Unfortunately, we did not travel during the season for farmers markets. That’s one of the things I would have enjoyed. Now that we’re home, I’m trying to learn to cook again. It’s amazing how quickly we forget certain skills. But I’m getting better. Yesterday I made oven fried chicken and banana bread. Who knows what I’ll try next. I even made a run to Costco. I guess life is getting back to normal. Where Did We Stay, What Did It Cost? People have asked us about where we stayed each night, the types of campgrounds we favored and the typical costs involved. Here’s a breakdown and a few notes about our overall lodging experience. · We spent 278 nights on the road, including the twenty nights on the road before Tim joined me in Maine. · We spent 31 nights in hotels. This included two nights in Fort Morgan during Tim’s mother’s funeral when we also paid campground fees for the RV. o After staying at an assortment of chain hotels the first two months, we discovered Drury Inns, which welcome pets. On the west coast where there are no Drury Inns, we stayed at a newly remodeled La Quinta Inn. o We stayed at the Miami River Inn, which my friend Jane manages, while we were in Miami. o We splurged on two-night stays at two different hotels, The Inn at Middleton Place in Charleston, South Carolina, and Lake Crescent Lodge in Olympic National Park, Washington, for Christmas and my birthday. o Nine of our hotel nights were prompted by a need to escape severe weather. · We spent a total of $10,622.41 on lodging, including $6,767.28 on campgrounds and $3,855.13 on hotels. We had anticipated that we would stay in hotels twice a week, and had budgeted $5,349 for campgrounds and $9,800 for hotels. We soon discovered that we rarely needed a break from the RV and did not need to spend nearly as many nights in hotels. Had it not been for so many instances of severe weather, we likely would have stayed even fewer nights in hotels. 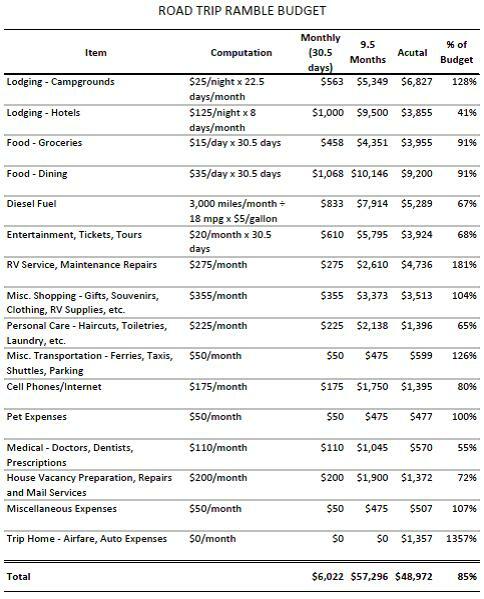 Thus, we ended up spending more on campgrounds, but much less on hotels. We came in under budget for lodging by a whopping $4,527. o Our most expensive campground was the French Quarter RV Resort in New Orleans, Louisiana, at $73.23 per night for two nights. Being in walking distance of the French Quarter made this rate bearable. o Our least expensive campground was the Lincoln Park Campground in Medicine Bow National Forest, Wyoming, at $5.00 per night. We used my newly-acquired Senior Pass which knocked 50 percent off the campground fee. o If we had waited one year to begin our trip, we would have saved 50 percent on most of our 16 nights in federal campgrounds using my Senior Pass. I’m glad we decided not to wait, however. o Our average rate per night for lodging was $38. Our average rate per night for camping was $27, and the average for hotels was $124. We had budgeted $25 per night for campgrounds. Thanks to the generosity of family and friends, and a few free camping spots, we were able to come close to that figure. We had actually budgeted $125 per night for hotels. o Although I didn’t qualify for a Senior Pass until the last month of the trip (I was able to use it to save $35 over three nights), we did have several memberships that provided considerable savings. Our favorite was Passport America, a membership that costs $44 per year but offers a 50 percent discount at over 1,800 campgrounds, although with certain restrictions. We saved approximately $650 in 31 nights over the course of our trip. That was a great deal. AAA and Good Sam Club, a membership that costs $19 per year, were widely accepted at many private campgrounds, saving us 10 percent on numerous occasions. Membership in KOA, at $24 per year, saved us 10 percent at all KOA campgrounds and offered points toward future discounts, which we were able to use. · We had anticipated spending the majority of nights in federal, state or county campgrounds, as opposed to private campgrounds, but that didn’t happen. The public campgrounds where we did stay were some of our favorites, especially the ones that provided hookups. Public campgrounds are typically in a much more natural setting and have greater space between RVs. However, we ended up staying in more private campgrounds since most public campgrounds do not provide hookups. Although some private campgrounds resemble parking lots, we did find quite a few in beautiful settings. We wrote about our growing need for hookups and our evolving campground preferences here. o Much of our trip took place in late fall, winter and spring, so evenings were chilly, and we found that we needed heat most nights. Our little electric heater turned out to be our best heat source, but that required electrical hookups. Although we could have used our propane heater without hookups, it was a bit noisy and would virtually drain our batteries with just one night of use as we found out a few times. We did love the propane heater for heating the RV in the mornings, however, since we could turn it on with a remote control without getting out of bed. We did not stop using the heater until the first of June. o We also needed electrical hookups to charge our considerable assortment of electronics each night. Although we could have turned on our generator for this purpose, we rarely used it because of the noise, vibration and exhaust fumes. Many public campgrounds also prohibit or restrict generator use. o We stayed in more KOA campgrounds than we ever anticipated. Generally these were nice, convenient campgrounds and had all of the amenities we needed, especially clean laundry facilities. I’m not sure we would like KOAs during the summer, however, because they cater to families with children. In fact, we would likely try to avoid any campground with pools and other child-friendly facilities in the summer months. Our experience in the off-season was much more peaceful. All in all we were pleased with the campgrounds that we found. Most were nice, and some were extremely nice. The rest were ok for just one night. We were lucky that circumstances forced us to stay in really awful campgrounds only a handful of times. Occasionally there were just no options in the area, and in those cases we just used the campground as a place to park and hook up. Note that I never bothered to photograph the less-than-desirable campgrounds. If we had made more of an effort, we could have saved more money on campgrounds by seeking out ones affiliated with Passport America or looking for less expensive campgrounds. However, at the end of a long day of touring, we found that convenience was sometimes more important than the few extra dollars we might spend. From time to time, we did enjoy staying in hotels, particularly on special occasions and after many days of very dusty campgrounds in the southwest. We found that it was not worth the effort to stay just one night in a hotel, however. Hauling all of our things, and Kitty’s, into a hotel was much more of an effort than simply pulling into a campground and hooking up. And Just What Was Our MPG? The end of the trip became particularly real today when Tim had to report back to work. Don’t get me wrong. Tim really loves his job, so in one sense he was looking forward to getting back to the park. However, his returning to work means that the trip is really over and that we won’t be going anywhere anytime soon, except maybe for a long weekend. I have to admit that I’m still adjusting to not being on the road, but I have no doubt that things will get easier. Last week was a transition time for both of us. We really didn’t do much of anything except relax. That was a good thing, as we both needed some down time. Extended travel can be hard work! I’ve started to compile a few statistics from the trip that might be of interest to at least a few folks. Today’s installment has to do with the question we were asked most often on the trip, “How many miles per gallon does the RV get?” Really, more people asked us about mileage than anything else. Here are a few statistics related to miles and mileage. · We traveled 25,238 miles during the nine months we were on the road, including the 3,528 miles that I drove from Colorado to Maine at the beginning of the trip. We had guessed that we would drive approximately 28,300 miles. · We averaged 91 miles per day. Our longest driving day was 333 miles. We had quite a few days when we didn’t drive at all. · Our average mileage was 18.7 miles per gallon. During the trip we had guessed that the average might be closer to 20 miles per gallon. However, we’re still happy with 18.7 since our original budget was based on 18 miles per gallon. · We spent a total of $5,289.07 on diesel fuel. We had budgeted $7,914 for the trip, based on $5.00 per gallon (we wanted to use a worst-case scenario to be on the safe side). Thankfully, prices were much lower than that. o The lowest price we paid was $3.599 per gallon on January 25, 2012, in Americus, Georgia. o The highest price we paid was $4.699 per gallon on March 22, 2012, in Trinidad, California. We did much better than we had predicted, and we had money left over for other, more fun, items. Even though the price of fuel is still expensive, it’s not a reason to cancel a trip. On a sad note, we received an e-mail today notifying us that Test, our second adopted sea turtle, passed away on June 7. Test had been at the Georgia Sea Turtle Center for a year after a fishing line had wrapped around her front flipper. The line had torn through all the muscle and other soft tissue down to the bone, and her entire flipper had to be removed. Test seemed to be doing well until the wound opened. Despite numerous treatments of antibiotics, as well as a blood transfusion, Test did not make it. The staff at the Sea Turtle Center is heartbroken, as are Tim and I. We are just grateful that Karen, our other adopted sea turtle, was successfully released back into the water. Tim and I drove back to Estes Park on Sunday in separate vehicles. He drove the RV with Kitty, and I drove the car, which Chris and Tom had kept for us in Fort Morgan. The sky was thick with smoke, and we learned that the wildfire had grown to 10,000 acres. The smoke had even drifted all the way to Nebraska. The air quality was very poor, and the wind didn’t help matters. We had planned to stop in Loveland to stock up on supplies since our cupboards at home were bare. Since Kitty was with us, we decided to take her into PetSmart with us. Pets are welcome, but I had never seen a cat in the store. Of course Kitty received lots of attention. Although she walked in on her leash, she was quickly overwhelmed with all the sights. She much preferred sitting in the child seat in the shopping cart. Tim teased the clerks and told them that Kitty had come for the buffet. She did seem to be entranced with the fish and birds, but none were harmed during her visit. The drive up Big Thompson Canyon was beautiful, and I was reminded that thousands of people come to Estes Park for vacation. I had been one of those visitors on three occasions before I moved here, and I love the town. I think summer is the best time to be here. Nonetheless, it was strange to be home again. The house was nice and clean, and Vicky had taken good care of everything, but it’s going to take a bit of time to adjust to being in the house. I just wandered around and tried to figure out what to do and where to start. There seemed to be no hurry, so I decided to just ease into things. I know that Tim is happy to be home. Kitty is also adjusting to being stationary, but she has started to rediscover her favorite places, and I think she’ll be fine as long as she is with Tim and me. We’ve been paying close attention to any news we can get about the fire. The High Park Fire has grown to be the second largest in state history, and there has been no containment. Dozens of structures have been lost, and hundreds of people have been evacuated. Tim and I realized that if a wildfire ever does threaten our home, we will be able to evacuate in the RV with Kitty and have a safe and comfortable place to live for as long as necessary. Next week, after Tim returns to work, I plan to write a series of wrap-ups about the trip. I’m not exactly sure what I’ll write about, but in the meantime I want to take time to sit back, reflect on the trip and remember the wonderful people and places we saw. After spending the night in the Medicine Bow National Forest, we began our climb over the Snowy Range Scenic Byway on Saturday. This byway is one of the most beautiful mountain drives in southern Wyoming and climbs over the second highest pass in the state. We reached the highest point on the byway at 10,847 feet and were amazed to find that the Snowy Range didn’t live up to its name. Even at that elevation there was a surprisingly small amount of snow. Is this the Snowy Range? Although we saw very little snow, we loved the rugged peaks and the alpine ecosystem. The mountain lakes were beautiful, as were the abundant wildflowers. We stopped at the highest overlook on the byway where we were almost blown away. The visibility was good, and we were able to see many of the adjacent mountains ranges, including those at Rocky Mountain National Park. Tim spied a wildfire in the distance, but we didn’t think too much about it at the time. After stopping in Laramie for lunch, we turned south into Colorado. Record high temperatures and a wildfire burning out of control near Fort Collins, which is not too far from our home, welcomed us back to our home state. The small fire that Tim had spotted had grown from 500 to 5,000 acres in just a few hours. We followed the progression of what came to be known as the High Park Fire as we drove south. It was a scary sight, and we knew that the recent drought and the high number of pine bark beetle-killed trees would make containing the fire difficult. We passed through Eaton, which was a kick for me, since it was fun to visit a town that shares my last name. Our final destination for the day was Fort Morgan where Tim’s sister Chris and her husband Tom live. They had kept our car and truck while we were away, and we wanted to visit with them and then retrieve the car. We spent a wonderful evening with family. Although we had wanted to take them to dinner, Chris and Tom thought we might enjoy a home-cooked meal instead. How thoughtful they are. They had invited Tim’s sister Cathy and other members of the family, and we were able to catch up with everyone over a great dinner. I can’t believe that we arrived back in Colorado when temperatures reached a scorching 101°. We are just not used to such heat. We had only a handful of very hot days on the trip, and that was just fine with me. Maybe we should have waited to return until Sunday, when a cold front was predicted to drop temperatures by at least 20°. Later in the evening the cold front ushered in very high winds. I’m just glad we stowed the awning or it would have blown away. It was blowing so hard that it was even hard to close our vent cover. Now, we could add high winds to record high temperatures and a wildfire. What a welcome home from Mother Nature!